Darrell Lewis, 84 talks about the way the pistons work on the locomotives and the way they drive the train. 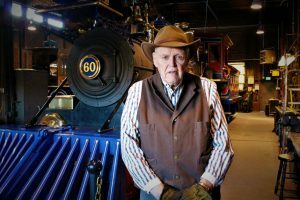 Eighty-four-year-old Darrel Lewis has operated and worked on the locomotives at the Golden Spike National Historic Site for 20 years. He doesn’t currently operate the locomotive, but he still volunteers to help maintain the old thing. 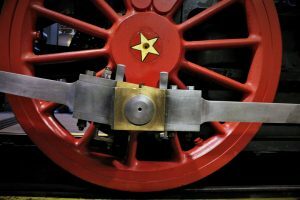 At 84, Darrel Lewis has operated and worked on the locomotives at the Golden Spike National Historic Site for 20 years. May 10, 2019 is going to be a big day for the historical site and the volunteers like Lewis who work there. It will mark the 150th anniversary of the completion of the Transcontinental Railroad at Promontory Summit. The Transcontinental Railroad is one of the great marvels of the 19th century. It connected the eastern part of the country to the west. The railroad cut the journey from San Francisco to New York City from four months to less than a week. Lewis has met people from all over the world who come to see where the golden spike joined the nation. It is located at Promontory Summit, in the middle of Box Elder County. The retired tire shop owner likes to talk and teach about the way things were and the mechanics behind the steam engine. The two replicas are stored in a big shop during the winter where they are maintained and repaired. The Jupiter is wood powered and the #119 is coal powered. 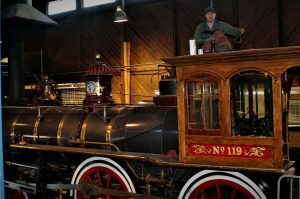 John Brown, a Golden Spike Ranger, is working on #119 getting it ready for the May 10, 150 Anniversary celebration. He also operates the engine. They used to let volunteers operate the engines, but things changed. Now they’ll only let employees of the Park Service operate them. The volunteer bug bit Lewis when he saw a newspaper advertisement looking for people to help at the Golden Spike. He went out there and gave it a whirl. Lewis said there was a lot to learn because of the way the engines are made. Lewis said he operated a steam engine on a sawmill when he was kid. The locomotives have a lot of similarities, but they also have a lot of differences. O’Conner Engineering, located in Costa Mesa, California, builds the replicas. They also built locomotives for Disneyland, he said. The Park Service keeps the locomotives looking sharp for every appearance. Lewis said he is excited for the 150 year celebration. He’s not sure what his schedule will be, but he is planning on being there. “We will all be dressed in period clothing and they will schedule when they want us here,” he said. President Donald Trump recently signed legislation to have the site changed to a National Park, but that hasn’t happened yet, said Park Ranger Lucas Hugie.